[Supervisor Mike Antonovich] – A motion by MTA First Vice Chair, Supervisor Michael D. Antonovich supporting the Antelope Valley Line Infrastructure Improvement Strategic Plan was unanimously approved by the MTA Board of Directors. “This unanimous vote is a step forward in our effort to provide a convenient, fast and cost-effective transit alternative for our residents in the Antelope, Santa Clarita and San Fernando Valleys who commute to Bob Hope Airport, Downtown Los Angeles and South all the way to San Diego, and from Ventura County to the Coachella Valley,” said Antonovich. 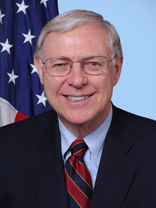 Antonovich’s motion directed the MTA CEO to provide a plan to advance segments of the Antelope Valley Line Corridor to preliminary engineering and environmental work and to develop a comprehensive grade crossing and grade separation safety program for Metrolink-operated lines in Los Angeles County.